Why Tampa Does not Rock. SO Does not Rock. Everyone has a greatest fear. That one thing that you hate more than anything else, way out of proportion to what it is. Mine? Roaches. I hate them like nothing else on this planet. I once couldn’t sleep for like three days because I saw one in the house but couldn’t get it quick enough. No way was I sleeping when that damn thing was probably just waiting for me to fall asleep so it could crawl in my bed. Ew, I feel a little sick just typing that. Um, seriously. Just to be clear, I stayed in Arizona for 2 years after my entire family (grandparents, uncles, parents, sisters…) moved to Florida because Florida = palmetto bugs. (roaches, people!) I have an old fashion Italian family where we get together for pasta on the weekends and we could easily take over entire neighborhoods but I ate pasta sauce out of a jar, family-less, to avoid this. Happily, it’s not near as bad as my preconceptions. I think I’ve had one roach in my house since I’ve lived here and I kind of got over it. At least they don’t have sewer roaches like AZ. THEN I saw one in my car a couple weeks ago. It was huge but dead. I drove home with my foot that I didn’t need for driving up on the seat with me and left it in the car when I got home. The next morning I psyched myself up to remove it, but it was GONE. Gone. It had been for sure dead, but I drove with my foot up on the seat for the next week (just in case) and wondered where the hell it went. My car hadn’t been dirty before, but it became the cleanest car on the block. Not that I go around looking in other people’s cars, but I’d bet. I saw another one a week later, killed it. From far away, with spray. Ya, I’m brave like that. Then Sunday night my son saw one in the car so I sprayed like crazy and we walked where we were going. Then comes Monday morning. There were 3 dead roaches, each easily bigger than 3 inches long. Needless to say I called in sick to work and fumigated my car. Twice, for a total of 3 bombs. 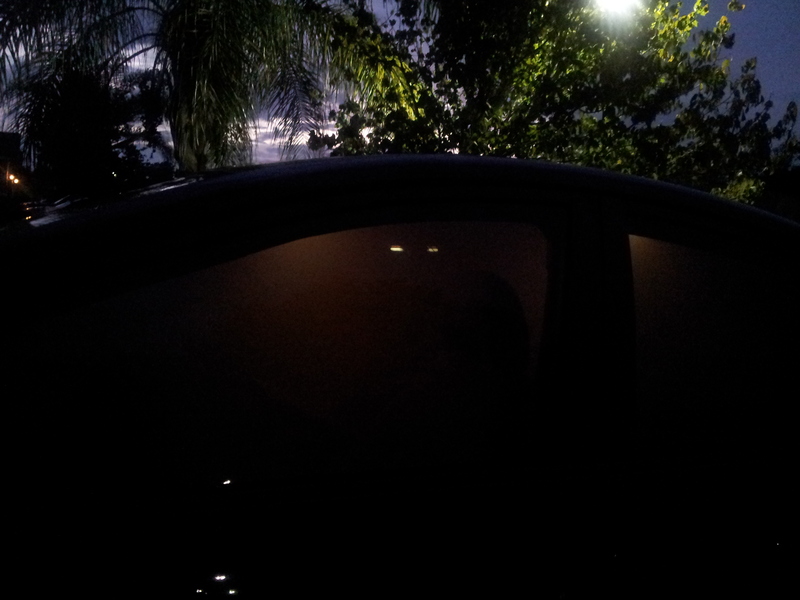 Yes, that is poisonous smoke you see through my car windows. The light is on in there, you just can’t see it through the lovely smoke. Needless to say I haven’t seen another one live since. Needless to say I still drive with my foot up looking around the car like I’m jonesing. And, needless to say I will be bombing the car again this weekend. Just in case. Of course I Googled this nightmare and you know the one state that’s known for this sort of thing? Florida. You are welcome for not throwing in a few select curse words. Oh, and just for good measure. On the way back from my lovely new place to walk on my lunch breaks I had to walk (way) around this. Because he (?) had zero fear of me and had no intention of moving out of my way. I love Florida, I love Florida, I love Florida. Right? ps- do you live in the city? Or an apartment? I just moved out of a downtown St Pete apartment & they were allover there. They seem to be WAY less in my new neighborhood. 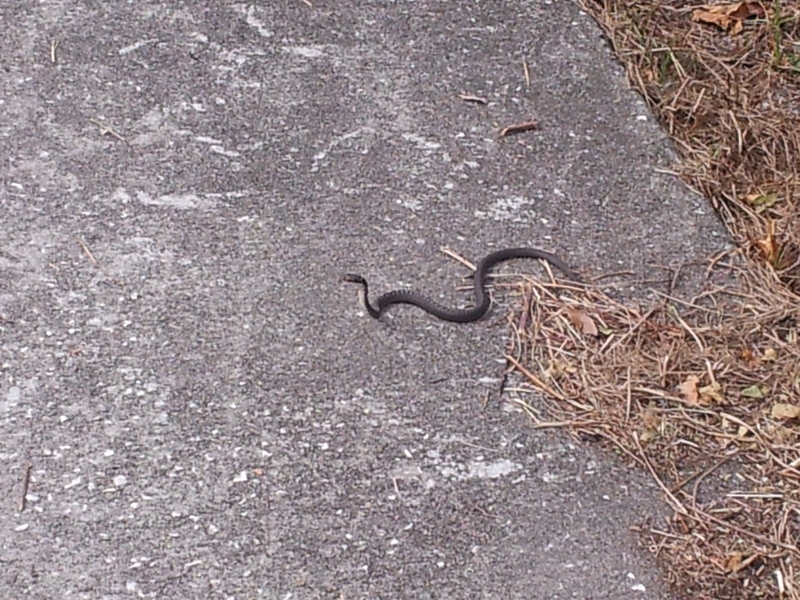 I hope I am not jinxing myself, but I haven’t seen one in the 5 months I have lived in my house outside the city. I kind of like the alligators. I work in Tampa but I live across the street from Starkey park so you’d think it would be bad but the only thing I usually get is big spiders. Not happy with this new development AT ALL.